If your room is popular you would want to keep it going 24/7, but you have to sleep and go to work etc, so you will need some help to keep the room open and running. A chat room administrator can apply various restrictions on visitors to your chat room. This includes the ability to 'restrict' a person from speaking, sharing video, or typing in the text chat area. They can also 'bounce' or ban people from your chat room (depending on settings you make). 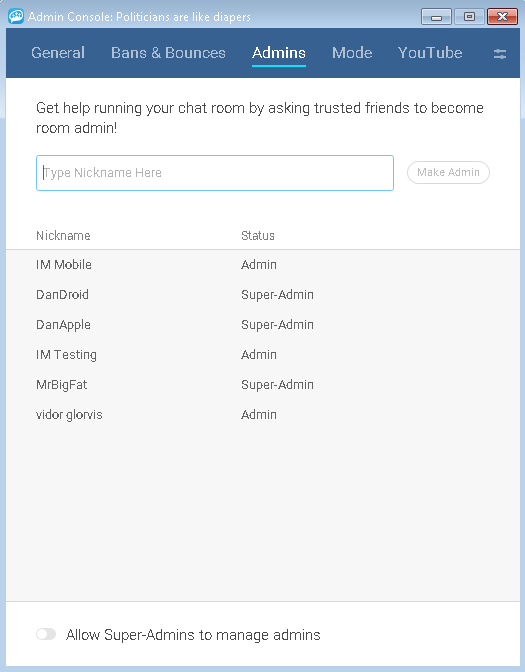 You can add or remove chat room 'admins' using the admin console. To open the admin console, click on the menu icon at the top right of the chat room (it looks like 3 horizontal lines). Now select 'show admin console' from the menu that appears. Click on the 'admins' tab in the header of the admin console window. To add a room admin, enter their user name into the 'type nickname here' box, and then click the 'make admin' button. The user's name will be added to the admin list below and they will be sent a notification. They will then be able to join the room as an administrator. To remove a person from your room admin list, hover over their user name in the list and then click on the 'X' that appears to the left of their user name. You can change a room admin's status to 'super admin' by hovering over their user name in the list, and then click on the 'super admin' button that appears. You can lower a person from super admin to a regular room admin by hovering over their user name in the list, and then click on the 'admin' button that appears. You can allow 'super admins' to add or remove regular room admins from the admin list by turning on the 'allow super admins to manage admins' switch at the bottom of the window.